Brief Synopsis – A middle aged couple meet a young couple and it changes their way of life completely. My Take on it – I have always been a fan of Ben Stiller’s work as long as he doesn’t go overboard and here he does a great job playing a middle aged man trying to find direction in life without even knowing it. Stiller and Naomi Watts have nice chemistry together and we can easily believe their relationship. Adam Driver and Amanda Seyfried, who play the younger couple, are a bit harder to swallow, but since they are meant to be a very eccentric couple, we don’t find them as annoying as they could be, but still a bit annoying regardless. This movie’s message about everyone finding their relevance in the world and the need to constantly recreate ourselves works well because it is gradual instead of being force fed to us. Has some funny moments that many of us can probably relate to and then some somber ones which also are easy to relate to. Unfortunately, this movie loses its way at the mid-point mark, but still somehow manages to recover during the final third in order for it to still work. Loved the small role played by Charles Grodin because he does it so well. 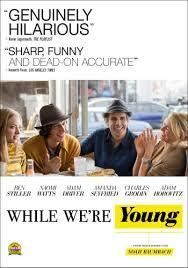 Bottom Line – Stiller and Watts are very believable together as a couple. Seyfried and Driver are a bit annoying but that is expected. The message about relevance and constantly recreating yourself is brought forth in a way where we are willing to accept it because it is gradually fed to us. Looses it’s way in the middle, but actually manages to recover in the final third. Recommended!